Wednesday saw a massive sun eruption not expected (especially that strong) being so far down the solar cycle already. In fact it has been the strongest solar flare in Cycle 24! 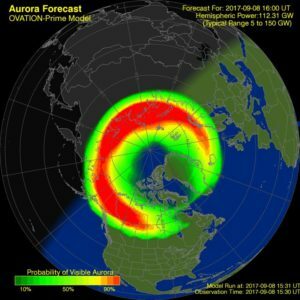 spaceweatherlive.com has an interesting article about it. After hearing about it on Wednesday evening and knowing most of it would be earth directed it was clear there would be some radio Aurora around about 48 hours later. That’s the time it needs to travel from sun to earth to then hit our planet’s magnetic field (which is protecting us from the rays’s effects mostly) and produce Aurora. I took care to be able to get home from QRL today a little earlier than usual at the moment, i.e. not working 11-13 hours a day. When I saw the first Aurora spots appearing on the DXcluster I called it a day at QRL and went home to join the fun. This entry was posted in Aurora, Propagation, VHF. Bookmark the permalink.